Earlier this year (2017) there was an extensive veld fire in the central Cederberg Wilderness, see Blog in right column across for most recent update on this trail. 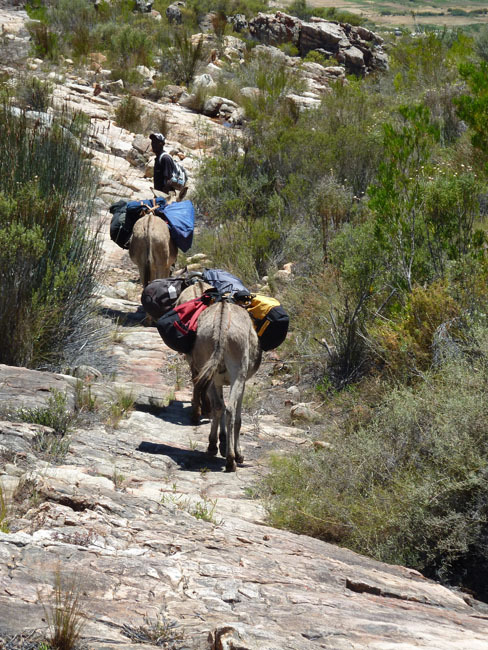 Arrive in Clanwilliam by 5pm for a briefing session by a Cederberg Heritage Route Representative at The Yellow Aloe Coffee Shop, You will be issued with a bag that is suitable for use on the pack donkeys that carry your luggage on the last two days of your hike. Please return the bag at the end of the hike, unless you choose to purchase it. At the briefing session you will be informed of the arrangements for dinner and your overnight stay at a local guest house. After a very early morning start with coffee and rusks you will be provided with a picnic “brunch” pack and will then be shown where to park your cars at the Cedarberg Travel office on a farm outside Clanwilliam. 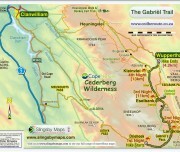 From there you will be transferred to the Driehoek Tourist Farm in the central Cederberg (about 46km on a gravel road). 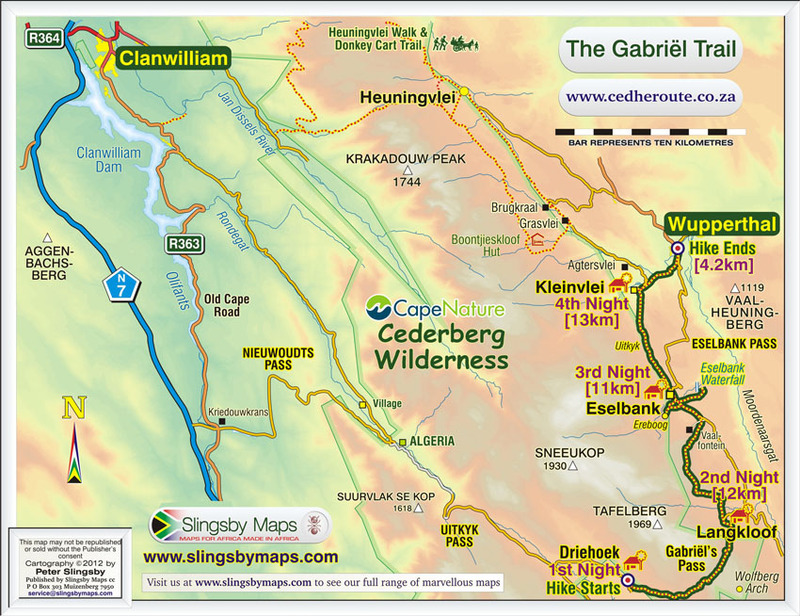 You will then commence an escorted day hike of about 12km and 6 to 7 hours over the very scenic Gabriël’s Pass in the Cederberg Wilderness to the little Moravian village of Langkloof. (Climb 530m and descend 430m, Rating 3B) Strong hikers may opt to be taken to the famous Wolfberg Arch, which is a detour from the top of Gabriël’s Pass of about 4km and 2 hours. 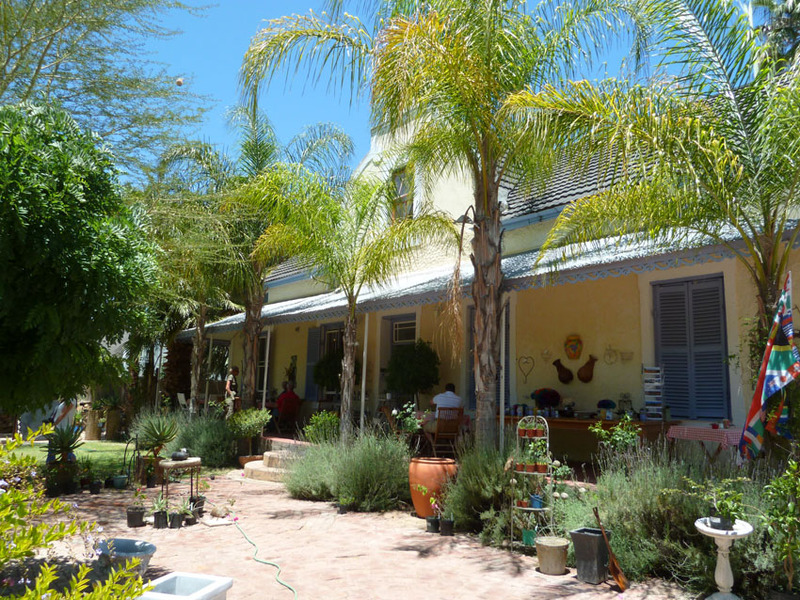 You stay overnight in the guest cottage in Langkloof on a DB&B basis. Escorted day hike of about 11km and 6 to 7 hours over the mountain from Langkloof to the Moravian village of Eselbank. (Climb 500m and descend 500m, Rating 3B) Note that about 5km of this hike is on a well marked route (white paint marks and stone cairns) through the veld. The route has been cleared of vegetation but there is not a properly constructed path. The terrain on this section is fairly rough under foot, so progress is slower than on a properly constructed path and more strenuous. However, the route is very beautiful and interesting with tremendous views. Consult your guide if you would prefer a less strenuous hike, as there is an alternative low level route around the mountain that follows the rim of an impressive ravine, known as the Moordenaarsgat. If the weather is unsuitable for the route over the mountain you will be taken to Eselbank by the low level route in any case. As this route passes near the Eselbank Waterfall, your guide may include the visit to the Eselbank Waterfall, instead of doing it the next morning. You stay in Eselbank overnight in the guest cottage on a DB&B basis. Escorted day hike of about 10km and 4-6 hours, Rating 3B, to the Moravian village of Kleinvlei. There is no guest house in Kleinvlei at the moment, so in summer you have the option to stay overnight there in tented accommodation in their campsite. If you don’t fancy tented accommodation you will be taken another 4km through a very beautiful kloof to Wupperthal to stay in a guest house. After breakfast (if you have stayed in the tented campsite in Kleinvlei) you take a short escorted walk through a beautiful kloof to the main Moravian village of Wupperthal. 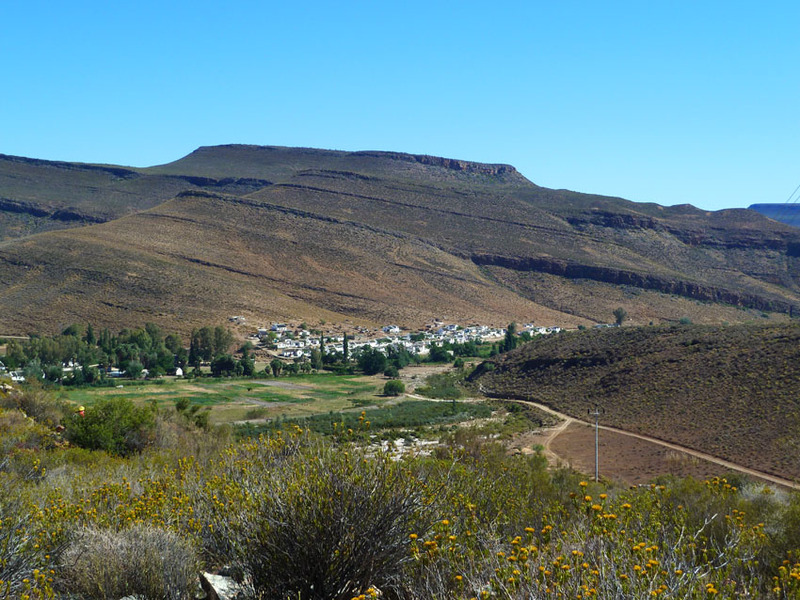 (About 4km and 2 hours, Rating 1B) You will be collected from Wupperthal at about 10am and transferred back to Clanwilliam (about 70km) arriving at about 3.30pm, after stopping off for a 2hr guided tour of the Sevilla Rock Art Trail (Rating 1A) and a picnic lunch. (The Rock Art Trail and picnic lunch are optional. If you exclude them you should be back in Clanwilliam by 12h30.) Depart for home. To request more information on this trail from Cederberg Heritage Route complete this form. For prices, rating and more information please visit the hiking trail page.